The Mercedes-Benz CLS has numerous safety refinements because of key contributions from suppliers such as Magneti Marelli S.p.A., Autoliv Inc. and TRW Automotive Inc. The car's optional LED headlamps from Italy's Marelli are beneficial because they more closely resemble natural daylight than other types of illumination, improving visibility and reducing driver fatigue. In addition, LEDs operate for about 10,000 hours, about five times longer than that of a xenon bulb. The CLS uses the LEDs in conjunction with intelligent lighting: such as the ability to curve around corners or adjust to provide illumination that best fits situation, whether it be highway driving or traveling on a poorly lit country road. The LEDs are also used together with the CLS's adaptive high-beam assist, a system that automatically switched to the headlamps to low beams in response to traffic ahead. The car's LED headlamp option costs 1,773.10 euros (about $2,485). 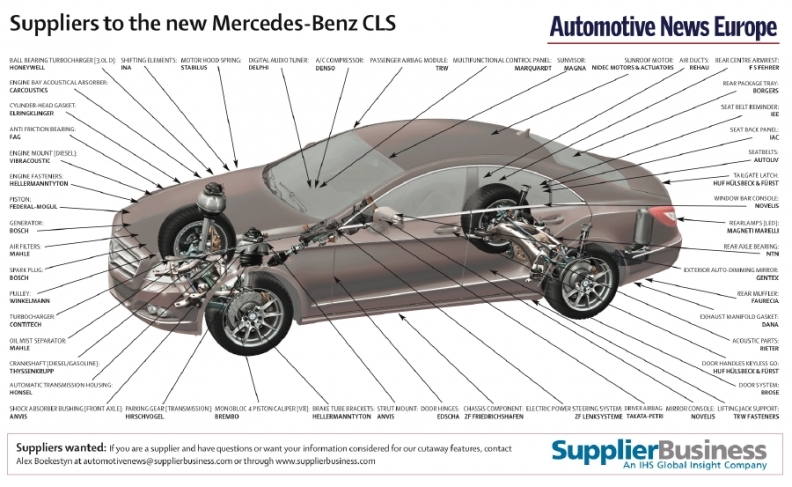 The CLS has nine airbags fitted as standard with an option of upgrading to 11. Autoliv Inc. provides the side airbag for thorax protection, the side airbag for pelvis protection and the side airbag for head protection. Takata-Petri AG supplies the driver airbag/steering wheel while TRW Automotive Inc. contributes the passenger airbag module and the knee airbag module. The knee airbag improves safety by deploying in coordination with the front airbags, helping keep occupants in a position less likely to sustain injury while simultaneously improving the effectiveness of the seat belt restraint mechanisms. IEE SA produces a sensing system that identifies the presence of child seats and adult occupants. It communicates with the airbag control unit to ensure the relevant airbags are not inflated if a child seat is detected, preventing injury to the infant. The system also reminds occupants to fasten their seat belts (sourced from Autoliv) when moving off. Mercedes assembles the CLS at its plant in Sindelfingen, Germany.